Everyone always complains when they hit their 30th birthday. Or at least, most of the people I know have. I guess the moving from the carefree 20’s to the dutiful 30’s is a frightening thing?? The fear of getting “old” maybe? For me, turning 30 is a fun thing. That pretty much sums me up. HA! I did everything early. I got married when I was 18… had my first daughter when I was 19… besides some college courses, I didn’t do that either, but started working and defied the notion that you “can’t get anywhere in this world without a college degree” because, well, if you tell me I “can’t” do something, odds are that I will go out of my way to prove you wrong. I love milestones, as they are really good times to sit down and think about where you’ve come from and where you are going. God has bestowed upon me 30 years on earth… what have I done with it? Have I been a good steward of the time He’s given me? I hope so. But God has used Annabelle to open my eyes up to a lot of things, many being my own failings and short-comings. I see all the time I’ve wasted on piddly, unimportant things. All the times I’ve been selfish and cared only about me instead of embracing, loving, and caring for those around me. I can see much more clearly just how meaningless a lot of things I used to care SO much about really are now. Scratch that. I don’t mean “meaningless” but maybe less important. My writing, for example. In NO way do I think it is meaningless. It is something God has called me to do, and at first, I jumped in feet first and let it take over. I was so afraid if I stopped or slowed down that I would miss out on what God wanted me to do. Part of it is impatience… but in my hurry to “write” and conquer all things in the fiction world, my family suffered more than they needed to, and I lost sight of where it needed to be on my priority list. I’ve only recently started writing again, and it feels SO SO SO SO good. But I’m careful not to overdo it, and I *think* I’m a better writer for it too. Instead of plowing ahead (which is my nature), I’m being more thoughtful and prayerful. I have a ton of other things I could list on the way I “wasted” my time in the last 30 years, but I’d rather look forward to the ways I can spend my time in the next thirty! Since my husband has to work ON my birthday… the plan was to celebrate by going out to eat on Sunday. Instead they planned a surprise party at my sisters house not far from the hospital. That was great, we cooked out hamburgers and played games. It was a BEAUTIFUL day for a picnic too! Temp in the 80’s, a light breeze, sunny skies. Especially since we are supposed to have horrible storms tomorrow! 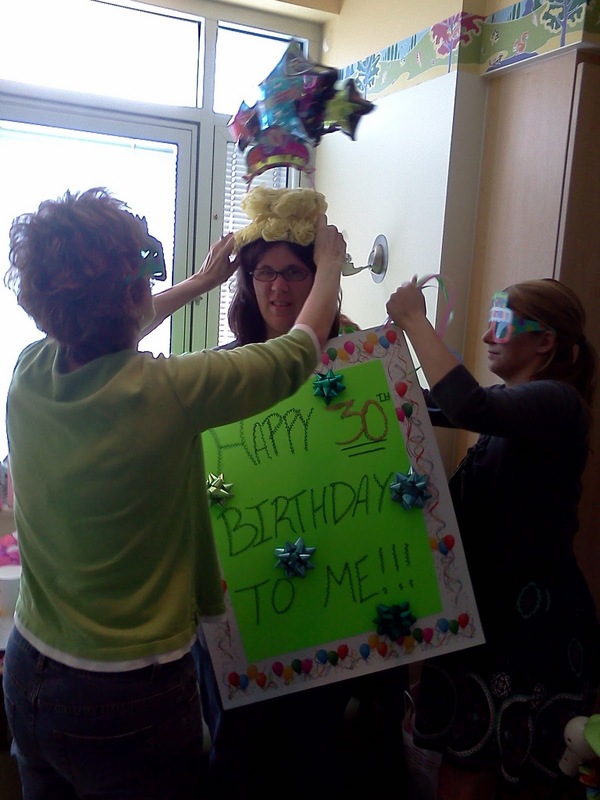 But they also decided that since it was a “milestone” birthday, I was required to be embarrassed. If you know me at all, you know that even though I love to have fun and I am pretty decent at embarrassing myself from time to time, I have a horrid dislike of being embarrassed by other people. 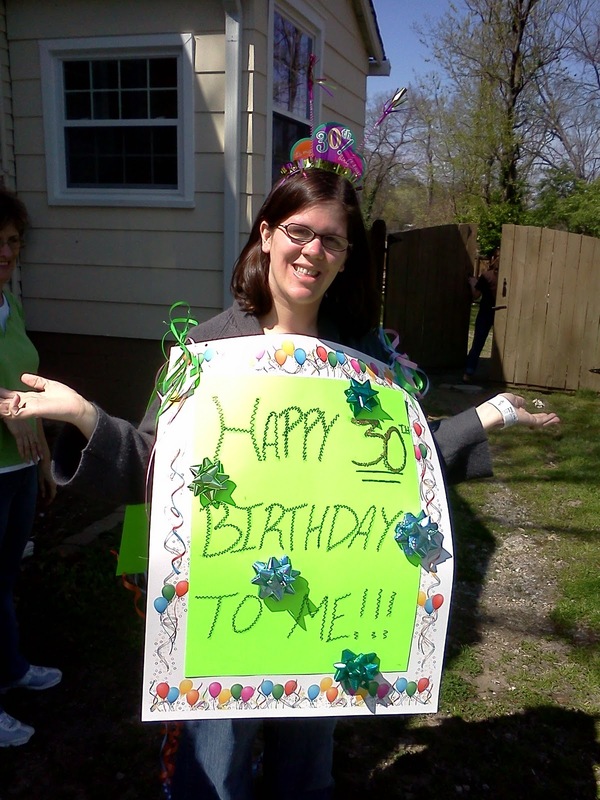 So you can imagine my mortification with my sisters and mother came to the hospital and made me wear a cardboard sandwich style sign announcing my birthday on top of a crazy birthday hat thingy. I forgive them though… because they did it out of love! In all, it was great fun, and I am so VERY VERY blessed to have such a WONDERFUL family who loves me and makes me feel special! THANK YOU! She’s doing SO SO SO good, y’all! No fevers in a LONG time, she’s been playing up a storm every day, and is sticking to her schedule almost perfectly! Mommy is BEYOND impressed with her! She doesn’t roll over yet, but rolls to her side good, and now that she figured out how to smile again, she does it ALL OF THE TIME!!! We walk in the room and tell her hi, and immediately she has this huge grin on her face. I LOVE IT! Grandma Johnson bought Annabelle her Easter dress yesterday! I bought it back and showed Annabelle, who was sitting her bumbo, and OH MY GOODNESS I wish I’d had a camera! Her eyes immediately opened wide and as did her mouth… it was like she was going “WOW!!!! !” and was in aw of it. The nurse and I about died laughing it was so funny! Dare we hope that she gets her heart in time to be home by Easter??? If we got our heart soon… it’s still a possibility! Every day morning I get to the hospital, and think, “Will this be the day? Is this Heart day?” One of these days… it will be! Lacy had her first softball game yesterday. They didn’t win, but they had fun, and she tried her best! She’s my good softball player! Our life just got a bit busier though, as we now add 2 games a week and 1 practice to our schedule! A few parting pictures… including one with Annabelle’s late Christmas present I told you about a few posts ago! SHE LOVES IT!!! Mommy’s sweetheart… SO SO SO true! Not sure where Annabelle stops and her blanket begins!!! Play on the floor time!!! Smile time!!! LOVE THIS ONE! As you can tell, she LOVES IT! And she gets good exercise too… it tuckers her out! But her feet can’t quite reach the ground, HA!!! 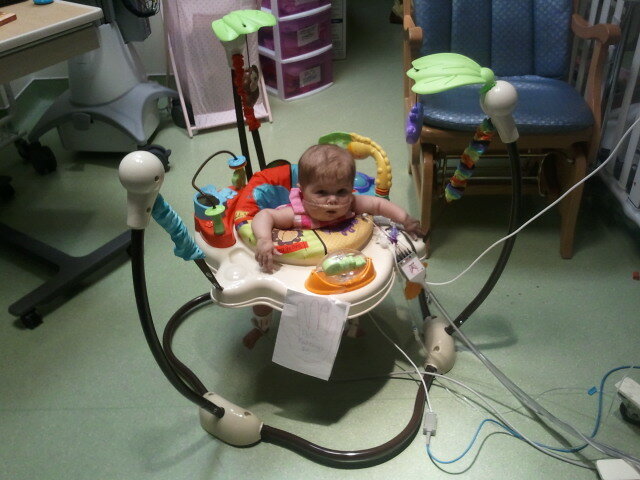 We put a slew of blankets or a book under there now so she can try to bounce herself! And Annabelle looks adorable in her hat! Great pictures! 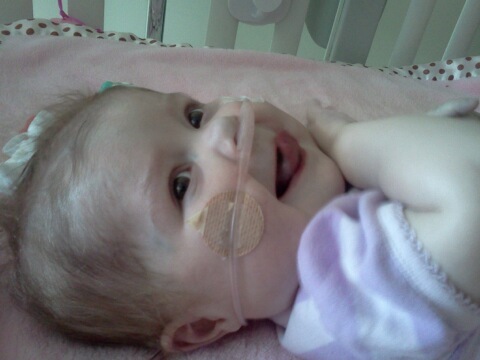 I am soooo glad Annabelle is doing well and smiling so much. Happy Birthday! I turned 30 last year and I loved it. I'm enjoying my 30's but you're right, most people don't seem to enjoy that milestone. As a 32 year old mama of four – I love my 30s and was thrilled at the milestone! HAPPY BIRTHDAY KRISTA! Your little girl is beautiful! 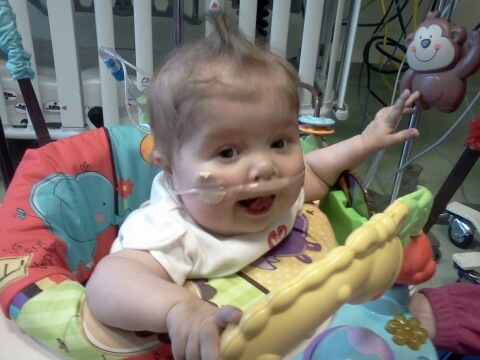 We continue to pray daily for Annabelle and each of you! Happy birthday, Krista! I'm glad your family threw you such a lovely surprise party. 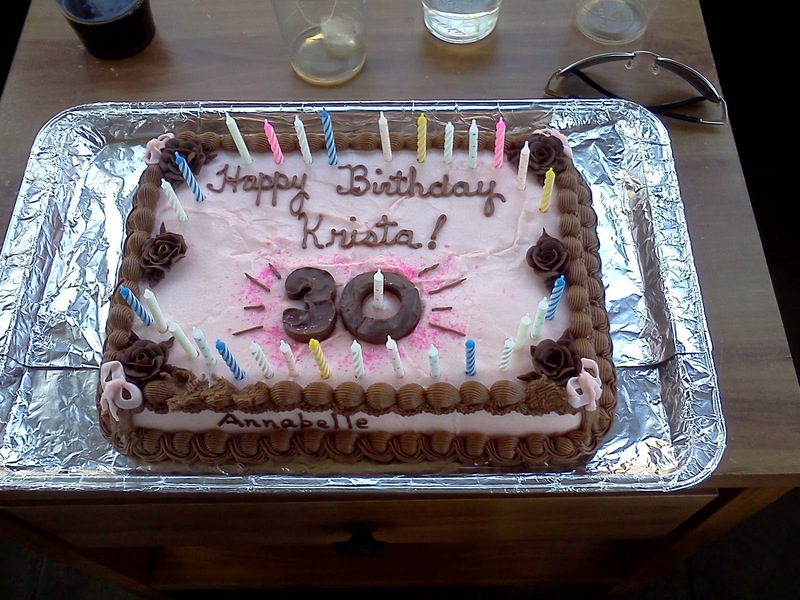 Happy b'day, Krista. Love the photos…she's SOO cute! And here's hoping happy heart day comes along soon. A very happy birthday, Krista! Happy birthday, Krista! We share the same birthday. I hope that you receive a BIG present today! If not, then we'll keep trusting in God's timing. I'm so happy that you had the surprise party- they are the most fun- and you deserved a day to be the queen. What a heartwarming post! It is soooo good to hear she is doing so well!! Happy Birthday Krista! I do have to say that today is my birthday also, and best of all I also turned 30!! I am having a harder time turning 30, but I guess I better get use to it! HAPPY BIRTHDAY to both of us!! Happy Belated Birthday, you young thing! It seems like it was definitely made memorable for you. You are blessed to have such a loving family. Thanks for sharing the wonderful pictures of Annabelle! I love the one of her smiling so big. I also love the one of her napping after she'd had her workout. We continue to pray for you, Annabelle and the rest of your family. 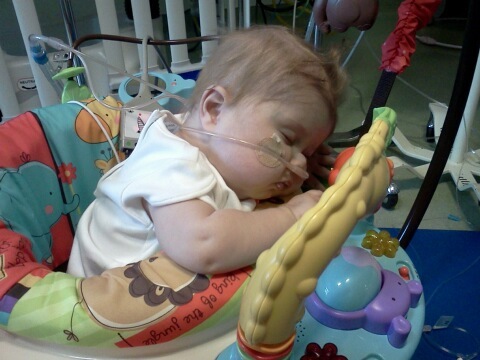 We're so thankful to hear that God has allowed Annabelle to have no fever. We'll continue to pray for strength and peace as you wait for God's timing. I haven't been around here in so long! So Happy Birthday to young you! ANd so WONDERFUl to see Annabelle doing so good!! She is adorable!